I remember one evening when my sister and I were young. We were staying with our grandparents for the summer, and Grandpa was to put us to bed while Grandma was out at a church function. But after we got ready for bed and had climbed the stairs to the loft where we slept, instead of tucking us in, praying with us, and rubbing our backs as he usually did, Grandpa said, "Let's make a memory." I asked what that meant, and he explained that it meant doing something with people you love so that you could look back and remember it later. That night, instead of going to bed at our usual time, my sister and I lay on the floor of the loft in the dark and talked with Grandpa. When Grandma came home, we were still talking. "What are you guys doing up there?" she called out when she heard our voices. "We're making a memory," Grandpa answered. It was clear that Grandma didn't understand, but she humored Grandpa and didn't scold anyone. I'm so thankful, because although I don't remember what we were talking about with Grandpa, a quarter of a century later, I still remember the excitement of doing something out of the ordinary just for the sake of creating a memory. It seemed that Grandpa was always doing things to turn ordinary moments into something special. Grandma, on the other hand, was much more practical. She showed her love by keeping us clothed and fed and bathed, and there was little room for spontaneous fun in her routine. Both Grandma's and Grandpa's types of love were necessary for us, but Grandpa's is what I remember more. Last night as I was getting my boys ready for bed, I announced that I was going to read them their Bible story on my bed, instead of in their room. They excitedly ran to my bed and immediately started to burrow under the covers. I managed to get through the Bible story in the middle of a pile of squirming bodies and thrashing limbs. I'm not at all sure that any of them heard the whole story, and when I closed the book and announced that it was bedtime, it was with a great sense of relief. 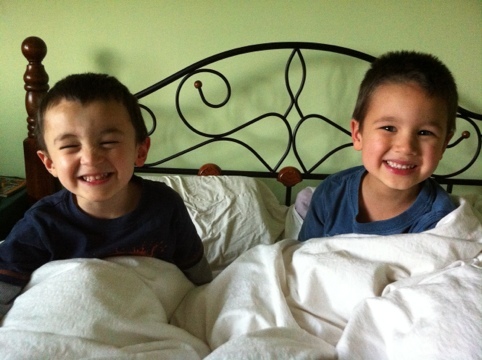 However, Samuel, my eldest, asked if they could stay in my bed. At first I said no, because–honestly–I had been ready for them to go to bed for over an hour. But then I remembered that evening from my childhood when we made a memory with my grandpa, and I softened. I am naturally much more like my grandma, and while I know there is a place for rules and schedules and nutritious meals, I also want to make room for fun and spontaneity and special treats. 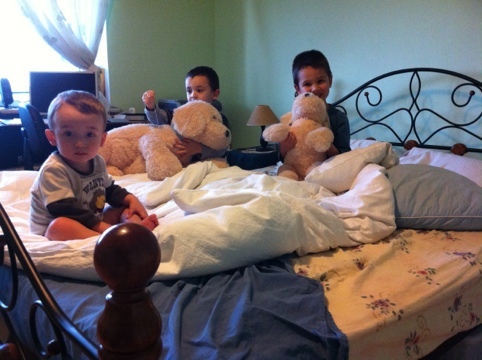 So last night I let the kids play gleefully on my bed until my husband came home and asked what we were doing. I smiled and said, "We're making a memory." 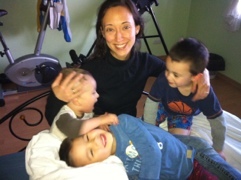 This entry was posted in Encouragement, Inspiration and tagged bedtime, parenting by Sharon. Bookmark the permalink.